Salina Central boys basketball coach Doug Finch sent a message to his squad, pleading for more effort after a 3-0 start. Senior David Grammer connected on five threes, the defense held South to 13 points in the first half, and No. 2 Central rolled Salina South, 60-45, inside a jam-packed Brickhouse. Central took down South for the eighth consecutive time. Salina Central (4-0, 1-0 AVCTL-I) scored the first 12 points before Salina South nailed two free throws with 2:45 to play in the first. The Cougars added a field goal, but Central increased its lead to 17-4 through the opening frame. 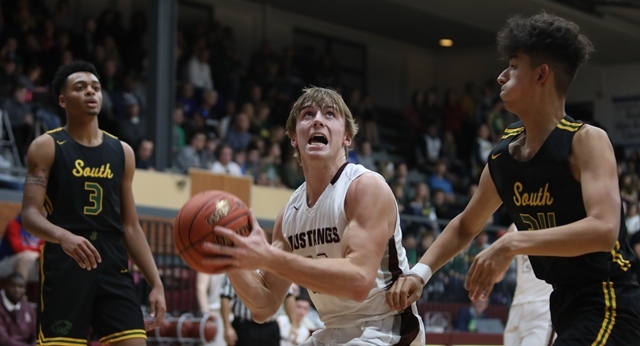 After hitting a pair of triples, David Grammer nailed two more, propelling the Mustangs to a 33-13 halftime advantage. South (1-4, 0-4) came back in the final period, scoring 24 points. SC’s D. Grammer was the Salina Ortho Player of the Game, pouring in a career-high 17 points. Senior Harper Williams added 16 while senior Ben Driver recorded a career-high 10 points. Sophomores Colin Schreiber and AJ Johnson paced the Cougars with 14 and 15 points, respectively. Salina Central hosts Derby on Tuesday with coverage starting at 5:45 on Sports Radio 1150 KSAL. Salina South steps out of league play to challenge Maize South, pregame at 5:45 on Y93.7. Much like the boys game, Salina Central took control early. The Mustangs (3-1, 1-0) limited the Cougars to two field goals in the opening quarter, charging ahead 18-6. Senior Selah Merkle had the hot start, scoring nine points in the first period. Salina South senior Camdyn Schreiber had the answer in the ensuing frame. South (0-5, 0-4) roared back, outscoring Central 17-8, paced by Schreiber’s 10, to only trail 28-23 at the half. South’s offense fell silent from there, only putting up 11 for the remainder of the game. SC’s Merkle was named the Salina Ortho Player of the Game, recording a career-high 17 points. Junior Kadyn Cobb and freshman Aubrie Kierscht provided 10 points each. Schreiber led the Cougar attack, finishing with 16 points.